BUILD UP Skills is an EU Initiative to improve the qualification and skills of Europe's building workers which are essential to build, equip and renovate buildings of high energy performance. The Initiative focuses on continuing education of craftsmen and other on-site building workers. From strategy to action: Based on agreed national roadmaps the BUILD UP Skills Initiative will support the introduction or upgrade of concrete qualification schemes on regional, national and multi-national level. Contribute to national priority setting: a key achievement of BUILD UP Skills will be endorsed national roadmaps pinpointing to the most important changes and concrete measures needed in the continuous education system of the building sector. Barriers to the training of building workers from various crafts will be identified. The need for improved skills to ensure significant energy savings in buildings will be quantified and priority measures for the up-skill of on-site construction workers will be established. Share and win: New skills and qualifications for the building sector are a common challenge across Europe. 30 European countries have joined forces and work together, to share their ideas and findings and to learn from each other. 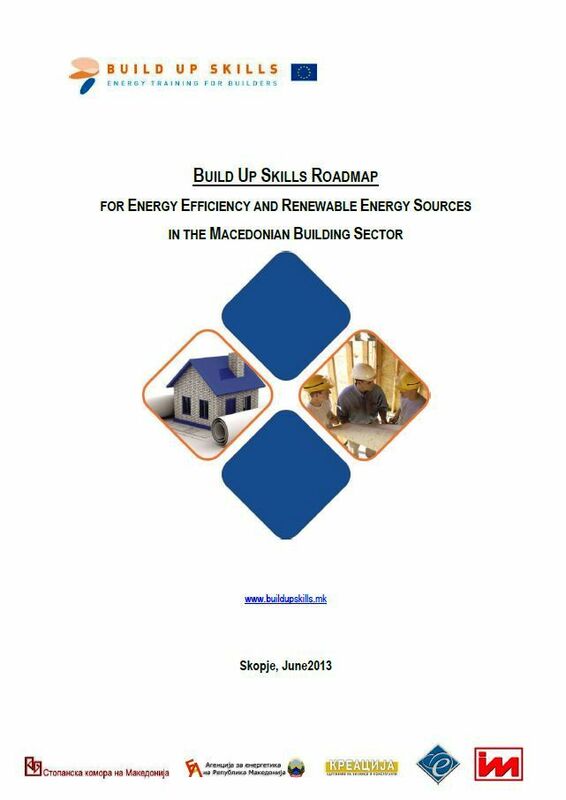 The Build Up Skills project in Macedonia, FYR defines the path that needs to be followed in the next seven years for the upgrade of skills and qualifications of the building workers in the practical application of EE and RES measures as the national energy targets for 2020 could be met. 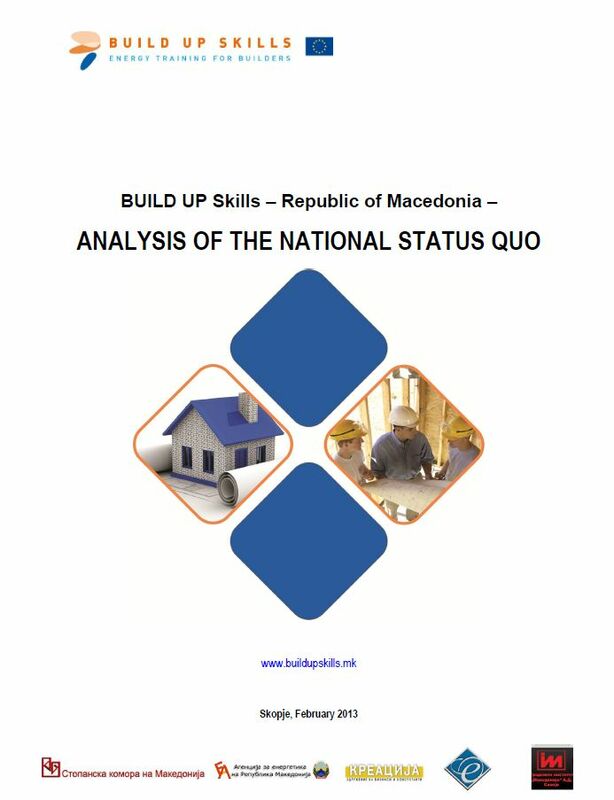 National Status Quo analyse, showed that the potential for building sector contribution in meeting national energy targets (36,13%) is current building stocks (private and public) as the 70% out of total 35,17 million m2 are more than 25 years old with the high average specific energy consumption. The need for reconstruction will increase labour demand to a new 10.000 on-site construction workers. 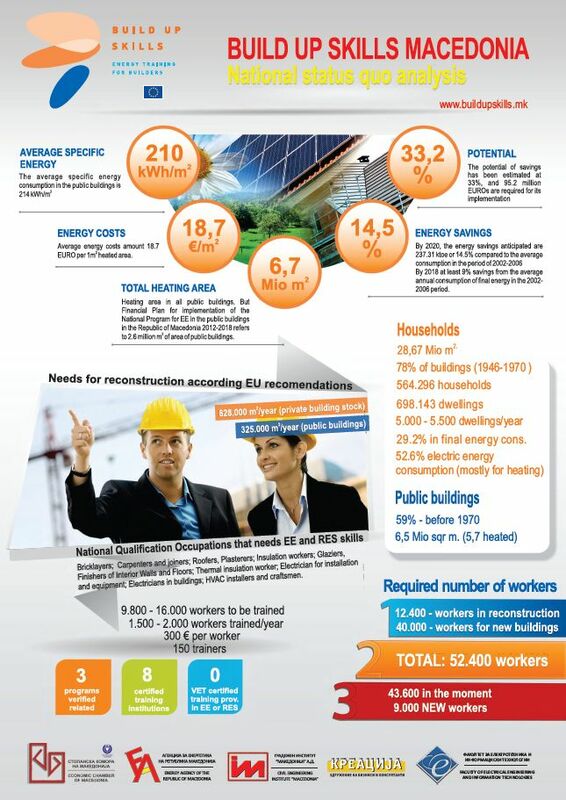 Highly fragmentised 4.400 construction enterprises with low level of specialization for EE and RES will need 9.600 qualified workers to be trained for upgrading EE and RES skills till 2020. Identified barriers to obtain required number of workers concerned to EE legislation, regulation of the construction sector market, education system and capacities of the institutions to these trainings. Roadmap with action plan encompasses of four priorities to overcome barriers in national education system, capacities of training providers and incentives to upgrade the skills for EE and RES. 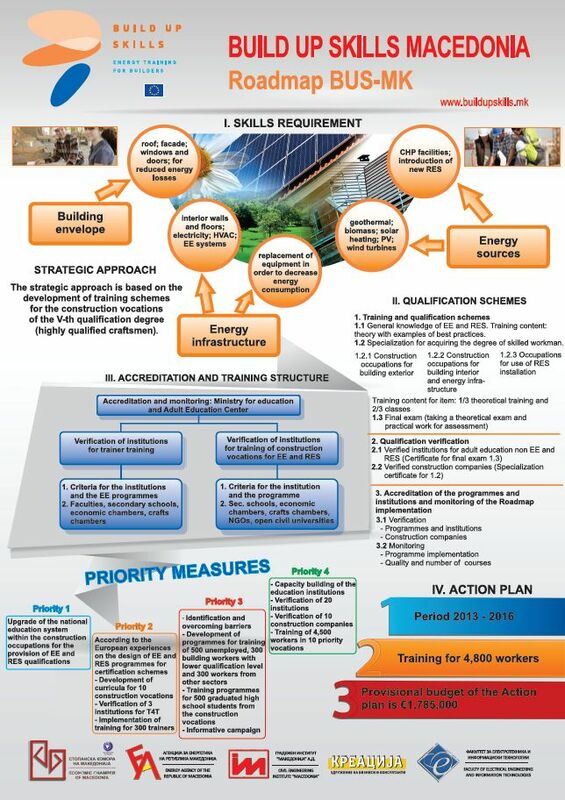 Implementation of 12 priorities' measures concerned to introduction of accreditation and qualification schemes for EE and RES, provision of 300 trainers and 30 accredited training providers that will enable training of 4,800 on-site building workers on EE and RES skills on two qualification level by 2016. Including measures for information campaign about training incentives for construction companies and workers the total budget for implementation of action plan is € 1,785,000. (c) 2012-2014 Project "BUILD UP Skills - MK"